Of the six “three up, three down” half innings in the 2015 Under Armour All-America Game, five came from left-handed pitchers (Forrest Whitley was the only right-hander to face the minimum). Working exclusively from the stretch, Graeme Stinson was among the lefties to make short work of his inning — and was also among the six pitchers to record two strikeouts (that group was split evenly among righties and lefties, with three each). So…to say he was among the most effective arms in Chicago is certainly accurate. He threw a lot of fastball strikes up to 91 mph, and was able to land his breaking ball at 78-80 mph. He really didn’t need a third pitch (though we’ve seen it before) as he made his way through the middle of the American order with ease to maintain the calming influence established the previous inning and a third by fellow National left-hander Jesus Luzardo. At 6-foot-5 and 245 pounds, Graeme Stinson featured a compact, simple delivery and worked from a low three-quarters arm angle. He showed feel for both his breaking ball and change, and used both 4-seam and 2-seam fastballs – giving him the ability to move the ball both ways. With his size and length, it looked like he was almost placing the ball in the catcher’s mitt. He featured excellent body control, and worked with low effort to repeat his delivery and to get his arm back and through. Most of the time, we eyeball velocity higher than it actually reads out, but in this case it was the other way for me. I eyeballed him in the upper 80s, but turned out to be off by a few mph. He touched 94 twice, and sat easily in the low 90s with his four-seamer, while his two-seamer was 88-89. He showed the ability to move his fastball to both edges, and threw a lot of strikes with his secondary pitches. His breaking ball was 79-81 with sharp 2-8 action, while his change was mostly a low 80s offering with fading sink. Through three controlled innings of work, he struck out ten of the fifteen batters he faced — including eight of the first ten in what was the most dominating outing of the entire event. 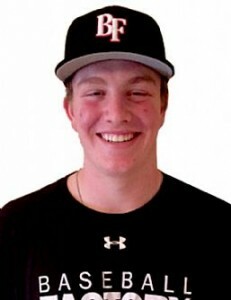 Based on his performance in Mesa, Graeme was selected to the 2015 Under Armour All-America Game, scheduled for August 15 at Wrigley Field in Chicago.